I love the sweater weather that is implied once fall arrives, but it's hard to part with all the pretty summer dresses, which is why today's look is all about using summer pieces in autumn. We all know florals are huge every summer, nothing surprising or groundbreaking about that, but they can also look cute in fall, especially when used as a detail. Wanting to use a floral dress as a detail, I layered a fluffy sweater on top to keep me warm and to give the look a fall vibe. To cover a bit more, while still looking stylish I added everyone's beloved over the knee boots, which are again very trendy this year. Over the knee boots are seriously a dream, they help you wear short dresses/skirt/shorts even when the weather has cooled. Wow. You look amaing *_* I love everything on you !! 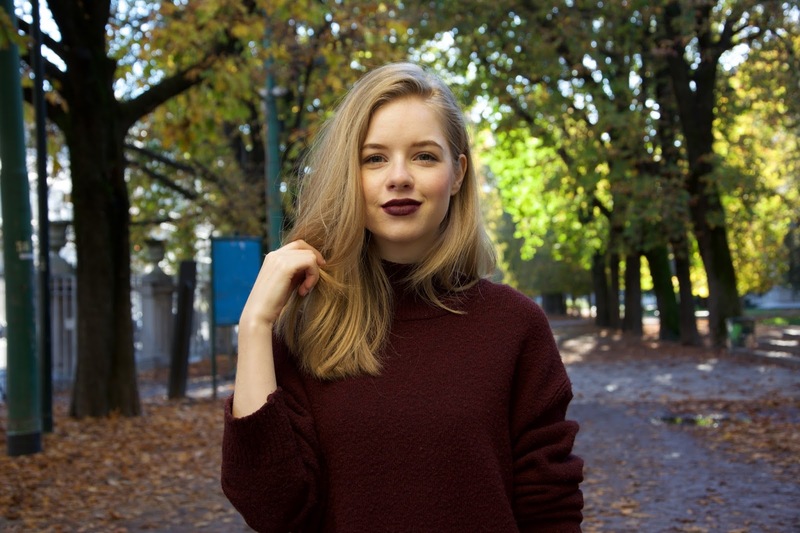 I really like this style,I like the sweater and the boots <3 btw I love how you look with dark lipsticks! I really love dark florals for fall, and this is such a great way to layer a floral dress! You look fabulous dear! I love your sweater! Especially layered over the dress like that. Such a cool way to style it! You are always so, so cute! My favorite thing about autumn is when the weather cools, because I love staying in bed when it's cool outside! I love a chunky sweater over a dress, it's so cute too. Haven't gotten any over the knee boots though, as I don't think they'd look good, but you work it well :) On another note, your lipstick matches your sweater perfectly! extremely fascinated with your sweater. This may sound funny, but the background is beautiful with the leaves from the trees gave it a good look... Lovely hair too. You are so Stylish, I love this look and your boots are everything!!!! Lovely post, I always had some problems pair summer pieces in the fall but the way you paired your floral dress with you sweater is perfection. Great look, I love your boots and sunglasses! I liked the way you wore the floral dress, with a sweater over it! The over the knee boots are a must, they keep legs so warm and chic! You look very beautiful! I loved your combination! Your sweater and your lipstick have beautiful colors. You styled this floral dress perfectly , this sweater is so cute. You look so chic. Love the dark lip! I think autumn is a great season to wander in nature, the landscapes change completely in this season :) Love your outfit, so cute!